“See me, feel me, touch me, heal me,” is the lyrical refrain from The Who’s Tommy. These eight words summarize what Deloitte has learned from the firm’s latest look into healthcare consumers, published in the report, Health plans: What matters most to the health care consumer. 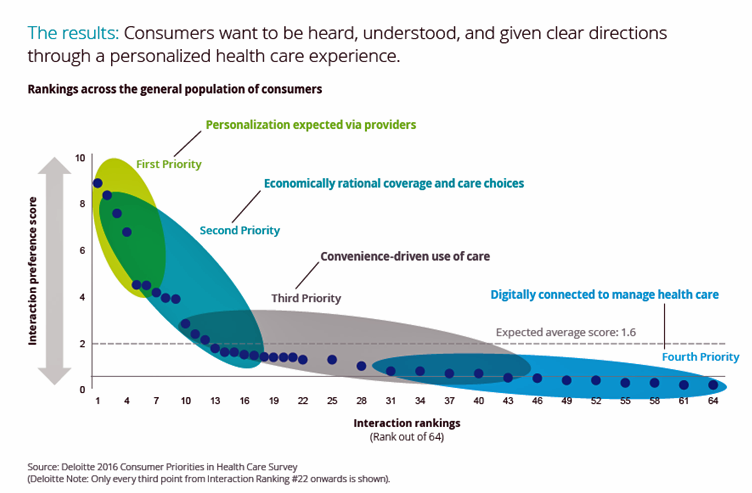 Personalization is Job 1: “Consumers want to be heard, understood, and given clear directions through a personalized health care experience,” the report asserts. That means, providers, please do not rush through appointments and spend time with “me,” listen to me, explain what I need to know and do when I leave the office, and give me helpful information about my condition that I can understand. Health consumers’ second priority is financially rational coverage and care choices. This means no cost surprises (like sticker shock when discharged from hospital, or surprise bills after an ER visit to an in-network emergency department). Health consumers as consumers want to know, in advance, what aspects of care will not be covered by insurance. Being in-network is key to the new health care consumer. Transparency is fundamental to building health consumer trust and satisfaction. Convenience in health care is the third important demand. This translates into no or very short waits in care offices, appointment availability, and accessible fast and effective customer service via call centers and digital touchpoints. Health Populi’s Hot Points: As health plans and providers accept and embrace more consumer-directed health care (motivated by value-based payment), care should be delivered where people most value the experience — in the office or institutional setting when required, but increasingly where people live, work, play, pray, and learn — rethinking the “four walls” as Deloitte puts it. Consumer satisfaction breeds health engagement; the 2016 American Customer Satisfaction Index was published this month covering Finance & Insurance for banks, credit unions, health insurance, property & casualty, life, and online investment services. Check out the benchmarks by industry in the bar chart: you will find credit unions, banks, and internet banking toward the top of consumer satisfaction (but below consumer electronics, beer and personal care). Health insurance? It’s the bottom of all financial services for consumer satisfaction, just above telephone services and internet service providers. Health insurance is the financial fulcrum for health consumers, who are spending more out-of-pocket and for first-dollar financial risk for health care. Take heed from Tommy, the deaf, dumb and blind kid: that’s how too many health consumers feel without transparency, clear instructions, and personalized treatment.